Like my Uncle Norman would say "What a collection of schmucks." Remember in Red Dead Redemption when it would rain? So you decided to find the nearest town and wait it out by playing a card game? No? Just me? #historicallyaccurateroleplay then… Well anyway this time there are a series of Challenges you can complete. How much money you make and/or lose is based on luck. Or at least the computer algorithm Rockstar put into place called "luck." For the sake of your sanity I would recommend skipping these challenges unless you're trying to go for 100% completion. Speaking from experience, and along with the other challenges available, these can feel like a real grind. 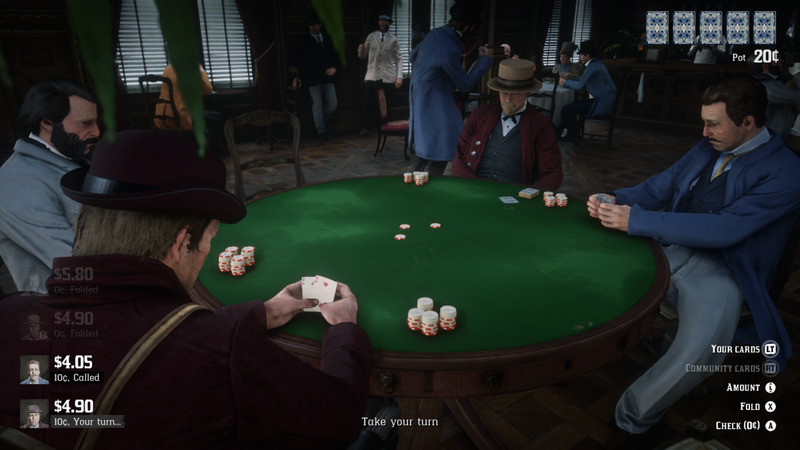 I mean the best strategy for any of Red Dead Redemption 2's challenges is to pace yourself, but with the Gambler Challenges you're going to feel like you're wasting your time. Don't get me wrong the first seven are fun, but Challenges eight-ten feel like the developers ran out of ideas and never bothered to have an emergency think tank. Though it's possible they're mentally brutal BECAUSE they expected completion seekers. Regardless I'll help you the best I can because unlike other articles online, I won't bull s*** you about some non-existent strategy. This is something I mention a lot for all of these Challenges, but the thing about the Gambler Challenges is that you can do these all from Chapter 2. I really implore you NOT to grind these Challenges (or any of them for that matter). Because you're going to rob yourself of the enjoyment of exploration and story missions. You might even begin to feel a little contempt. Challenge #1: Do this after the Chapter 2 Mission "Who Is Without Sin". 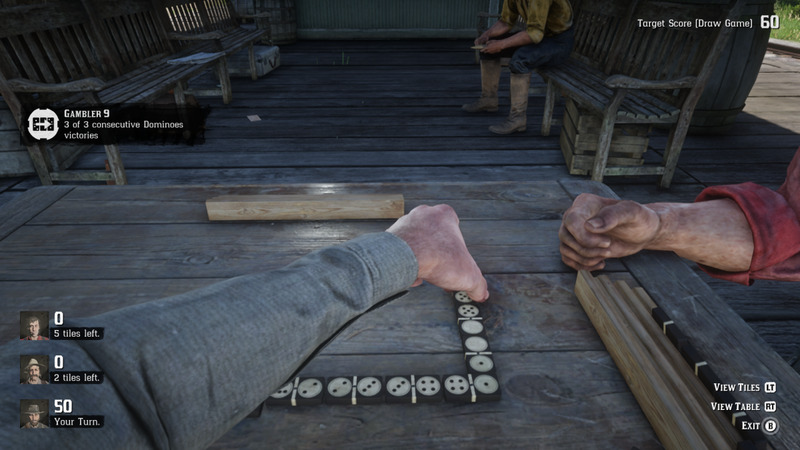 Challenge #2: After you start Chapter 3 ride into town [Rhodes] and do this at the Saloon. 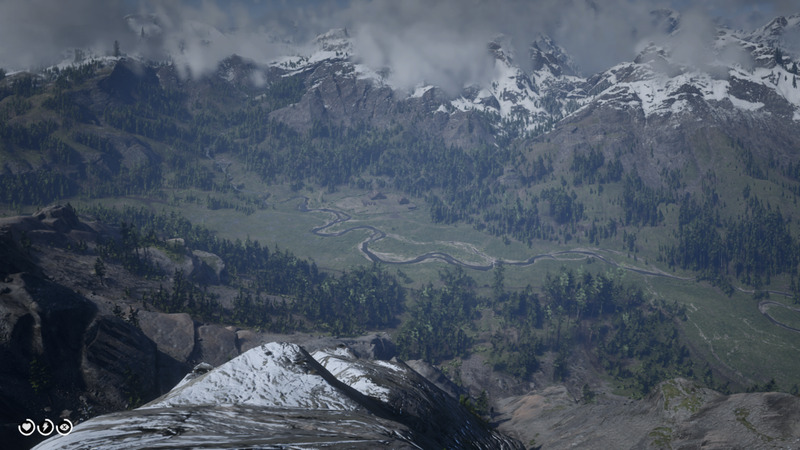 Challenge #3: Do a couple missions, take a train to Annesberg, then ride south to Van Horn, from there Stagecoach where you need to go. Challenge #4 and #5: Do these in the beginning of Chapter 4. 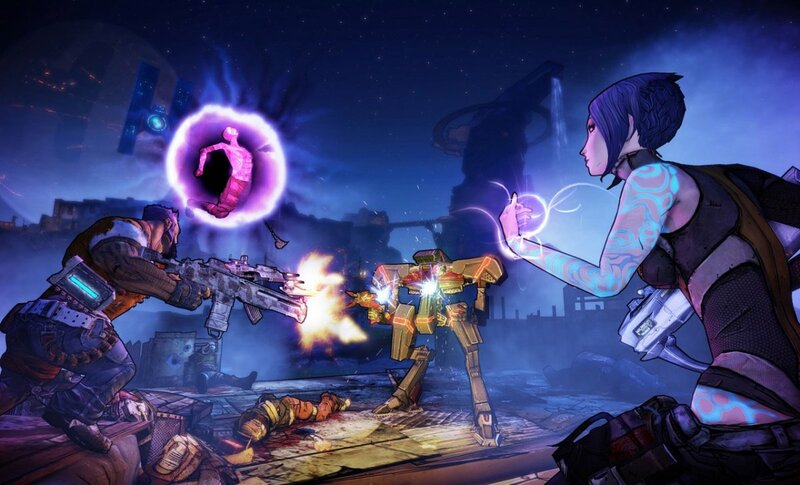 Challenges #6 and #7: Do in Chapter 4 but sort of midway through, with a couple missions in-between to break the monotony. 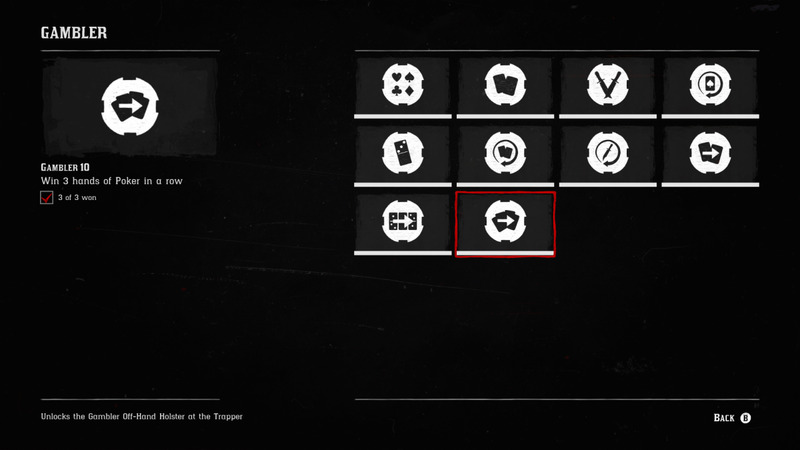 Challenges #8-#10: Don't even bother with these, but if you're going for a 100% playthrough save them for during or after the Epilogue. Chapters 5 and 6 move along at a type of pace where you won't bother wanting to do Challenges in general. Let alone do ones created by an obvious mad man. Gambler Challenge #9 ("Who thought this was a good idea!?" Ride to Flatneck Station (South-West of Valentine) and spend $2.50 to buy-in to the Poker game there. You don’t have to win EVERY hand, just five of them. Your success is based on your starting two cards. I’ll go more in to that with Challenge #4 below, for now enjoy the game and good luck! (Also refer to the chart posted with Challenge #4, it's a prevalent help for all of the Poker related Challenges in this guide). Yes this picture is more relevant than you realize. The earliest, and closest, Blackjack table game I honestly know of is at the Hotel in Rhodes. 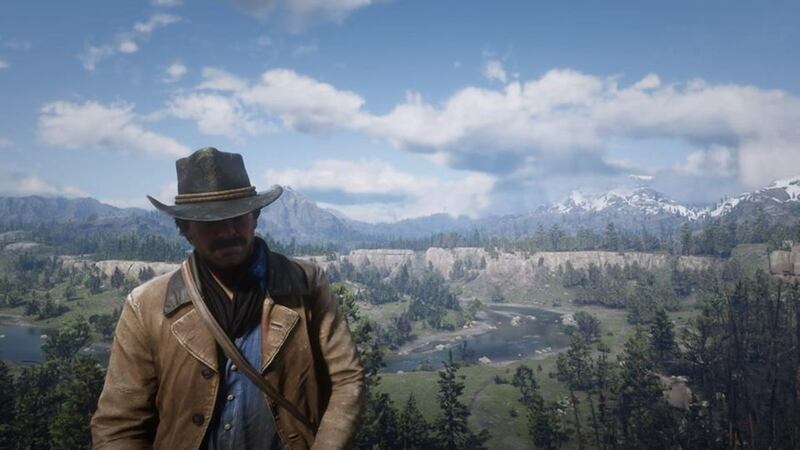 The story takes you there in Chapter 3, but in Chapter 2 you can take the train from Valentine there to get at this Challenge early, it’s up to you. (Remember you don't want to grind these for the sake of your sanity). When Can You Do It: Chapter 2, after the Mission “Blessed Are The Meek?” or Chapter 3 if you took my advice about Challenge #2. When they say “games” they actually mean “rounds”, you just need to win three “rounds” of Five-Finger Fillet to qualify for this Challenge. What you’re gonna want to do is “go on tour” to make it easier for yourself, or you can just play all three rounds in one location. If you’re that skilled then I say go for it, but for the button pushily disabled like myself do the following. There are three locations that I know of off-hand (hehehe); Strawberry, Valentine, and Van Horn Trading Post. Start at the one in Valentine, right outside the smaller Saloon. The first round is always a two button sequence, easy to win. The objective is to get as many (preferably MORE) laps in 20 seconds than your opponent. You can end your turn early, once you have more laps, by pulling Left Trigger/L2. Each round has three turns, but whoever scores higher twice wins the round. Before round 2 starts, exit the table. You just "won" one game of Five-Finger Fillet. Next take the Stagecoach to Strawberry (once again you need to have discovered the town by heading to Micha's mission marker for "Blessed Are The Meek?") and play a round with THAT guy. 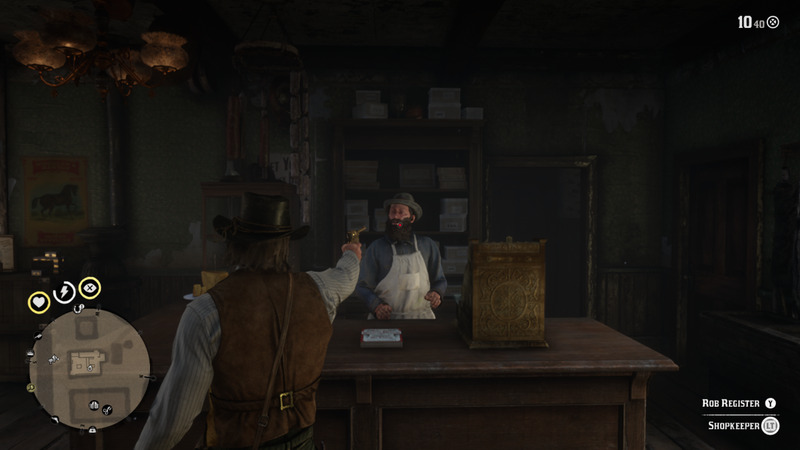 If you haven't discovered Van Horn Trading Post yet just go do a few missions to pass the days, then repeat the process with the guy in Valentine or Strawberry to win your third "game". No this isn't about a jailbreak; what they mean is you need to make a player, in Poker, lose all of their money in one hand. The best way to do this is through going All-In on a hand, but you gotta make sure it's a very good hand. 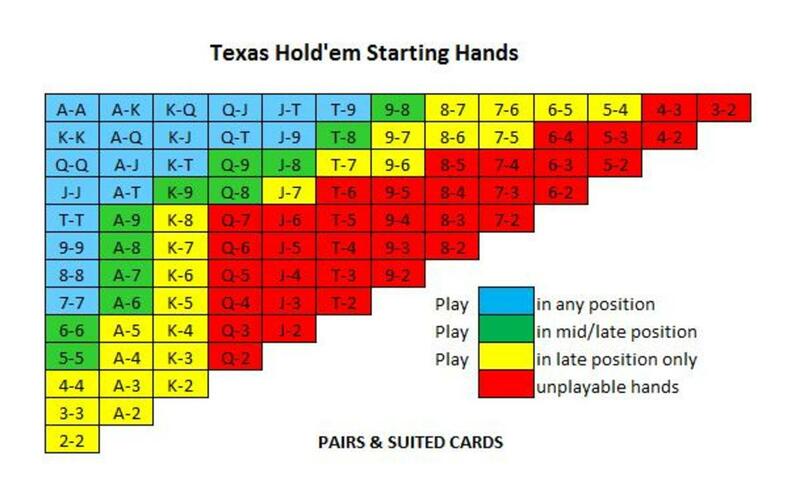 Your hand is mainly based on your beginning two cards, using the Texas Hold 'Em chart below do the following strategy to ensure winning is more likely. Any two cards that are red Fold, and then press Right Bumper/R1 to move things along. Any two cards that are yellow play until one of the other players Raises (this doesn't happen all of the time but it's most likely.) Green cards are playable but don't Raise unless you feel confidant about your hand. Blue cards are the most likely to bust another player out, but don't go All-In until the other five cards are revealed. If the opponent thinks they have a better hand they will also go All-In as well, and then if you win you'll bust them out. That moment doesn't come around often so you'll have to play a few hands (in each location) until you complete this Challenge. 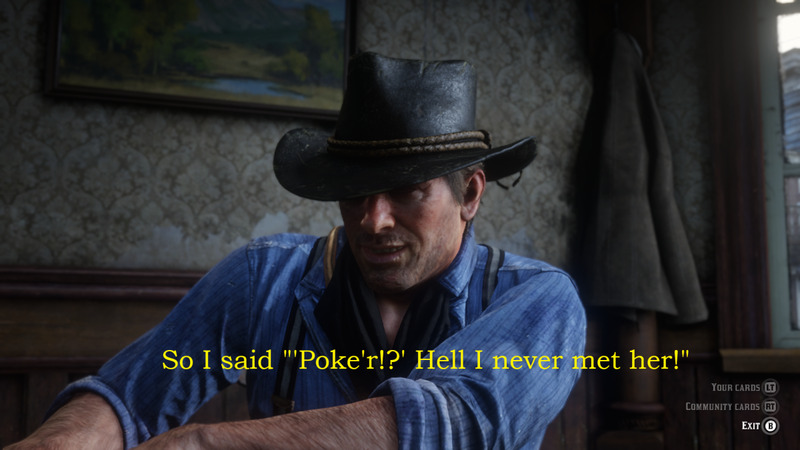 Don't let the suits in Saint Denis foll you; the players are the same in each location, it's just the buy-in amounts that change. Use the chart below and you'll have a better chance of winning. Go to the Dominoes game in Emerald Ranch, it's the simplest version of the game that doesn't involve match fives, and threes, or whatever. I never liked those particular versions of the game since even WHEN YOU DO get a number that is a multiple you don't score any points! Anyway there's plenty more to rant about later, for now press+hold Y/Triangle to spend $1 to start playing. Just make sure it's only two opponents or this won't work. If it's one guy sitting there you're more likely to draw a tile during this Challenge. "But wait Eric, what the hell does that mean?" you're thinking. Each player gets a set of Dominoes, the rest go into a place called the "boneyard", THOSE are the Dominoes you want to avoid. 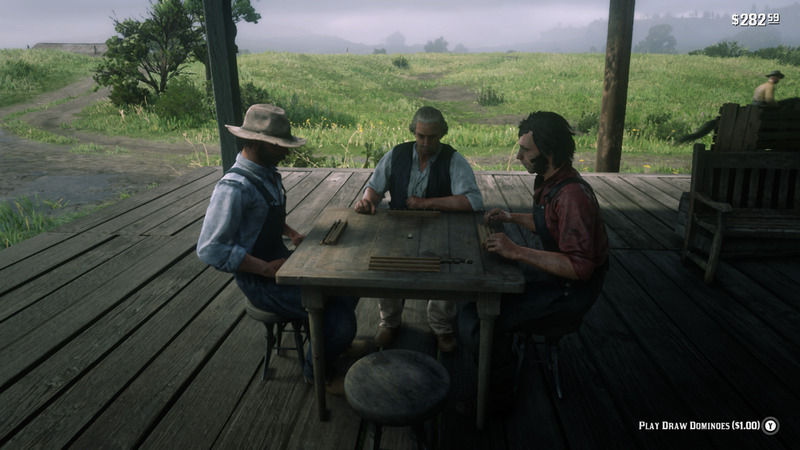 However Arthur, and other players, will only draw from the boneyard if they have no other pieces to play. Thank God this Challenge doesn't have to be done consecutively (that genital pain is saved for a later Challenge) you essentially just have to keep playing games of Dominoes, WITHOUT DRAWING, until you win three rounds not games. Points are rewarded depending on how many pips (the little dots on the domino tiles) your opponents have. That includes you! So be petty and play any dominoes that have a lot of pips to keep the other guy from earning too many points at the end of the round. This would be the ideal setup for NOT drawing any tiles, but unfortunately Rockstar planned ahead. So come back when there's one or two player(s) here. The two locations are Rhodes and Van Horn Trading Post. What this Challenge indicates is that you have to play Blackjack at each of these locations until you win against the Dealer. It only takes one winning hand. 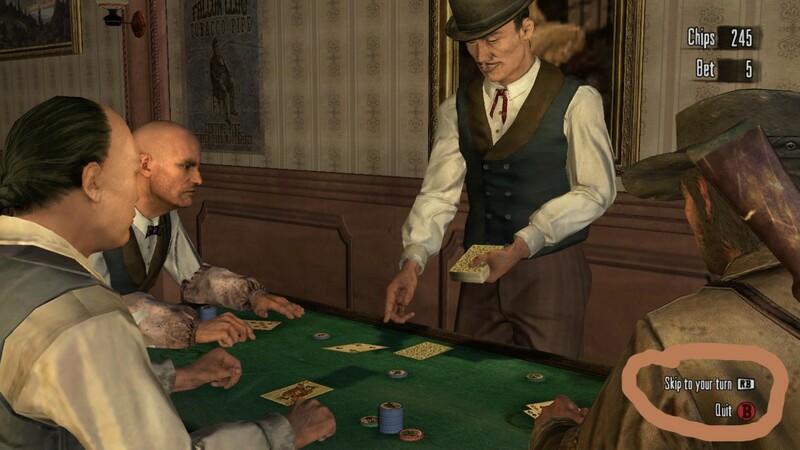 Once you beat the dealer in one place, take a Stagecoach to the other and play until you get a winning hand there too. 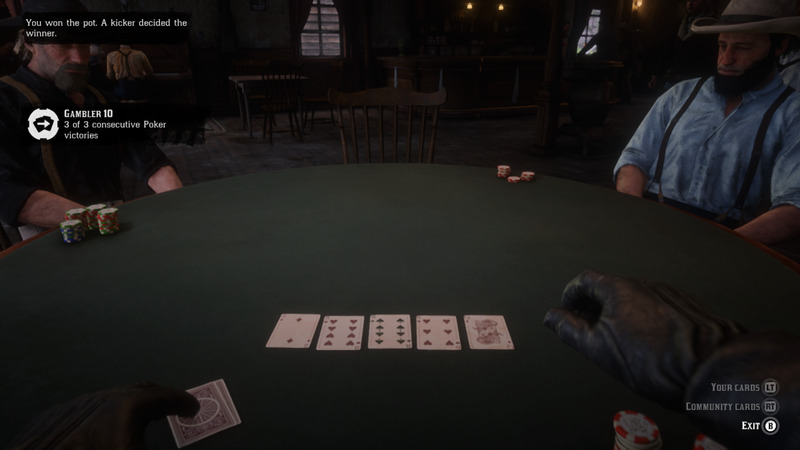 In my honest opinion this is one of the easiest Gambler Challenges, and can be done if you just like playing Blackjack. Remember Stand on 17 or higher and Aces are either worth one or 11 points. 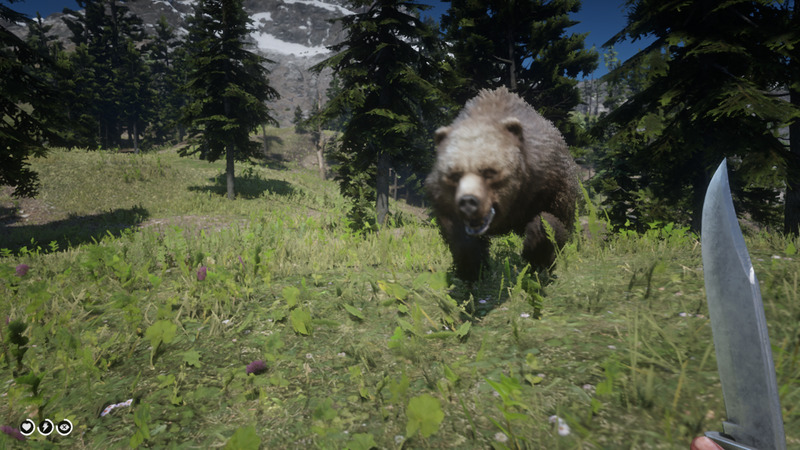 I wish Rockstar would bring back this feature. Would trim Challenge #7 down by about four hours. Ok at this point I can smell that Rockstar started running out of ideas for these Challenges. In fact these were probably one of the last things they worked on before the end of production. This Challenge is an exact repeat of the one in Challenge #3. All you have to do is play the first opponent using the two button sequence and you're good! Take a Stagecoach to the other two places (depending on which you chose first) and beat them too. Just keep in mind that the following three Challenges are doable, they're not impossible. However they will take a lot of time. 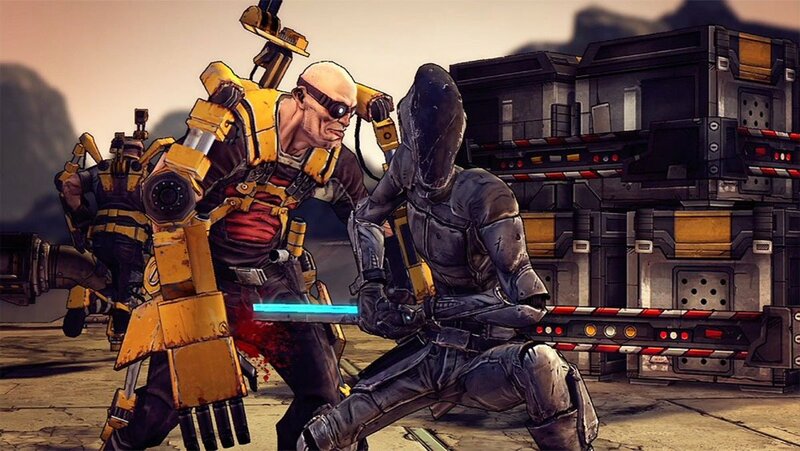 These are more like endurance challenges than games of skill. 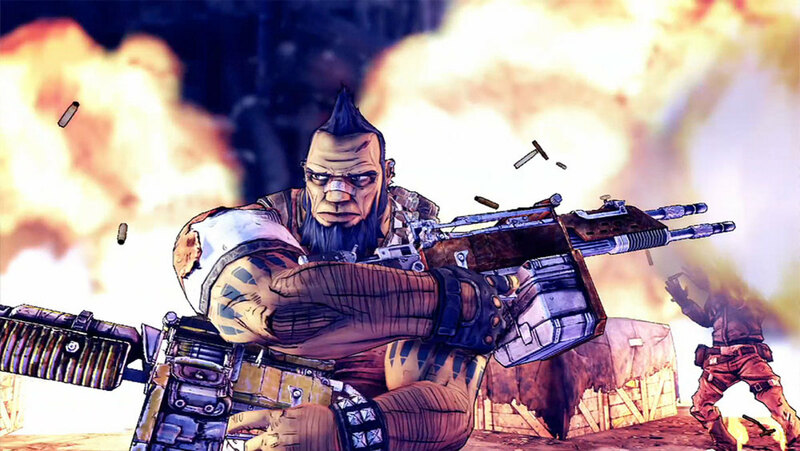 There's no lucky hat or trinket like Fallout: New Vegas that can help make these go smoother. I'm sure you were hoping there was (I know I was), so it's come to the point where I'm really only writing this guide so that the series isn't incomplete. TL;DR: Endurance, there is no luck, just patience. When Can You Do It: When you find the will to want to. 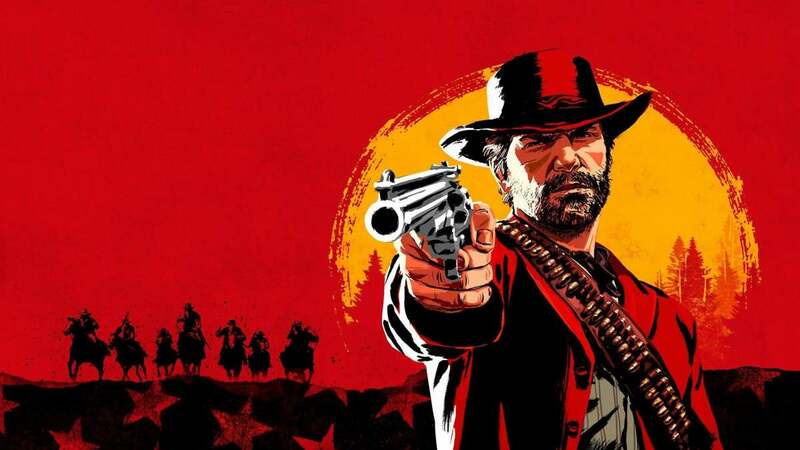 I seem to remember some article I came across, about three days after Red Dead Redemption 2 came out, where some guy ranted about how so painfully hard Gambler Challenge #2 was. Boy I bet he loved this one! He had no idea what he was complaining about. THIS Challenge is the epitome of wasted time. You can play Blackjack for hours before you get even one hand where you hit three times without Busting (going over 21 points). The best thing to do is sit at the far right side of the table (if you can) that way you're the first to bet and play. Also bet small. A lot of people say it's based on luck, yeah kind of since "luck" sort of comes in a wave of computer coding. It's more about patience. You need to be a stubborn s.o.b. but you also need to ignore what the game tells you sometimes. For example a Nine and an Ace equals 20, but once you Hit that Ace goes from being an 11 to being one point. Therefore you want hope you get Aces so you only get ONE point per Hit. Or other low cards that add up to 21 as you Hit. It's not impossible but it is a rare occurrence. So if you're REALLY dedicated to doing this Challenge you should have your phone handy to pass the time, OR be a struggling writer typing up an almost useless article on Hubpages. To each their own, however you want to pass the time. When Can You Do It: No do you really WANT to? It doesn't matter how many players are at the table, or if you draw tiles from the boneyard or not. This is yet just another trial of sufferance (emphasis on the "suffer"). General consensus seems to be that playing All Fives is useful for this Challenge, but since I still can't seem to personally wrap my mind around how that version works just do whatever game of Dominoes works best for you. I managed to beat this challenge, after a LONG time, playing the standard game at Emerald Ranch. I don't want to sound like that guy in numerous Youtube videos who says "it's just luck lol" but it pretty much is. If you feel like you're about to lose, after winning one game, you can quit then rejoin without resetting your progress. After an excruciating undetermined length of time YOU WILL get three wins in a row. After you're done consider if you're a masochist for putting yourself through that nonsense. Compared to the last two Challenges this one isn't so bad. You can thankfully press Right Bumper/R1 to skip ahead through hands, if things aren't going well. Ignore the chart I posted with Challenge #4, you can't afford to muck cards if you're trying to win three hands in a row. Folding will reset your streak. Use the chart until you get a winning hand, then hope the next two winners as well. Bluffing is actually a good tactic with this Challenge though expect opposing players to call your bluff. At which point I hope you have a good hand or you'll reset the Challenge for losing. Once you win the first hand (using Challenge #4's chart), just push on until you get three in a row. Because of story spoilers I couldn't record a video, As you can see it CAN be done, though I don't know if you would even want to get this far. Remember perseverance is the only trick to these Challenges, unfortunately. Random "luck" and being stubborn. I hope you make a save so in case you go for 100% you can do it later. A good place for challenge 9 is Emerald Station with one other player. I won 5 games in a row while doing challenge 5.